I have always had a great interest in the events of the First World War that lasted from August 1914 until November 1918. As a child, I grew up with the culture of it all. My grandfather served in the British army and fought at Vimy Ridge, northern France, during the conflict. He was poisoned by gas, left totally deaf but somehow survived it all. He was discharged in 1918 and went on to run a successful business. He drove his car almost every day until he died in 1964. We were a close family but could only communicate with our grandparent by writing everything down for him. 2014 marks the centenary of the commencement of World War One and many of the historical features are being commemorated in northern France where most of the fighting took place. A visit this year is a splendid opportunity to remember relatives that served in that war. I decided to catch up earlier this year and enjoyed a splendid coach tour spread over three days travelling to a number of the prime locations. Joining a specially prepared and organized coach trip for such a visit is certainly a good plan. A number of the war sites and memorials are located in fairly obscure locations amongst the rural French outback. The coach driver is the expert and knows exactly where to find them all. Your seat is confirmed and you can just relax and enjoy the view as you speed effortlessly through the countryside between the settings. I travelled with Galloway European Coaches based in Suffolk. The driver’s name was Derek Stringer and he was an authority on all aspects of the Great War. Those of us on the trip were taken to the most out of the way locations in perfect safety. Derek was able to keep us completely informed about all the history if we had any questions to ask him. With my fellow passengers, I joined the coach in London. We drove to Dover and sailed across the channel to Calais with P and O Ferries. We set off to Mons first of all, a town that is actually in Belgium. Our visit would begin there. Mons was the site of the first Great War engagement between the British forces and Germany. The first two Victoria Cross medals were awarded for action in this battle. We visited the memorial to Lieutenant Maurice Dease and Private Sidney Godley, the recipients. We also visited the beautifully presented St. Symphorien Cemetery on the edge of Mons city. This provides a resting place for both allied and German soldiers killed in the war. The cemetery is also home for the bodies of the first and last commonwealth soldiers killed in the war. The first was Private John Parr killed right at the start after war was declared. The last was George Price, a Canadian, killed by German fire moments before the armistice was declared. Visitors can track their headstones down; they are compelling. From Mons, we headed back into France. We visited La Cateau Cambresis, the spot where British forces first clashed with the Germans on French soil. This occurred on the 26th August, 1914. British soldiers were led by General Smith Dorrien but were heavily outnumbered by the German army. Loss of life and injury was wholesale. Nearly 9000 British troops were killed or injured in a battle that lasted three quarters of the day. The last battle of the Great War took place on the 4th November, 1918. This also raged close to Cambresis and involved the celebrated English war poet Wilfred Owen. This poet is remembered by the French as a literary icon. The cellar where he spent some time sheltering from shelling in France is preserved as a monument to him. The words of his poetry are projected on to the walls of the building for all to read. The language has translated so well into French. Gallic society loves the artistic symbolism and the poetry demonstrates such maturity from a person so young. Owen was killed in the battle on the 4th November 1918, just a week before the end. He was just 25 years old. His headstone can be found in the commonwealth war grave in the village of Ors, about 30 kilometres south east of Cambrai. I have little interest in poetry generally but, as I read his words, I could sense the acute poignancy. We in our group spent that night in a comfortable hotel back in Cambrai, organised by the coach company. The next day began in a more light hearted style. 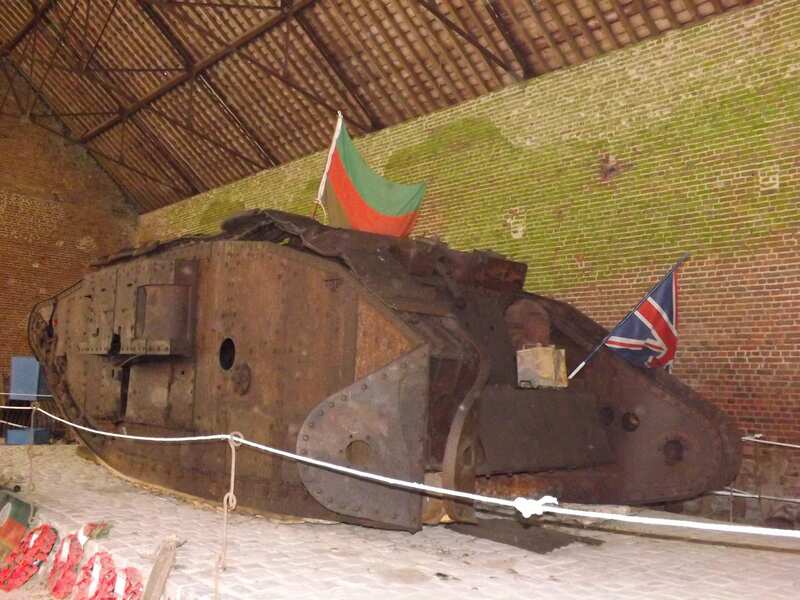 We visited Deborah, the preserved British D51 tank that was discovered buried on the edge of the village of Flesquiers, not far from where we were. Philippe Gorczynski, a local hotelier, discovered Deborah and knew so much about her. He provided a fascinating insight into her history and the war in general. Deborah was given her name by her five crew members. Their remains were taken from the wreckage and all were given a full military funeral so recently in 1998. The invention and use of the British tank was instrumental in eventual victory for the allied forces. Deborah is so well preserved; you can inspect her at close quarters and touch her. Later that day, we travelled on to Arras, a little to the northwest towards Calais again. We visited the Wellington Quarries and were reminded once more about the appalling living conditions that faced all soldiers fighting for their country and comrades. The Wellington Quarries are limestone caves and tunnels under the streets of the town of Arras. They were used by the British Commonwealth forces to secretly hide over 20,000 troops for many weeks. The soldiers were to participate in a secret and successful attack right under the toes of the enemy just above. It was the battle of Arras, April 1917. Allied soldiers would certainly have looked forward to seeing the sunshine again despite the heavy slaughter. It was an interesting tour and I thought about the sort of experiences that my grandfather had to endure. 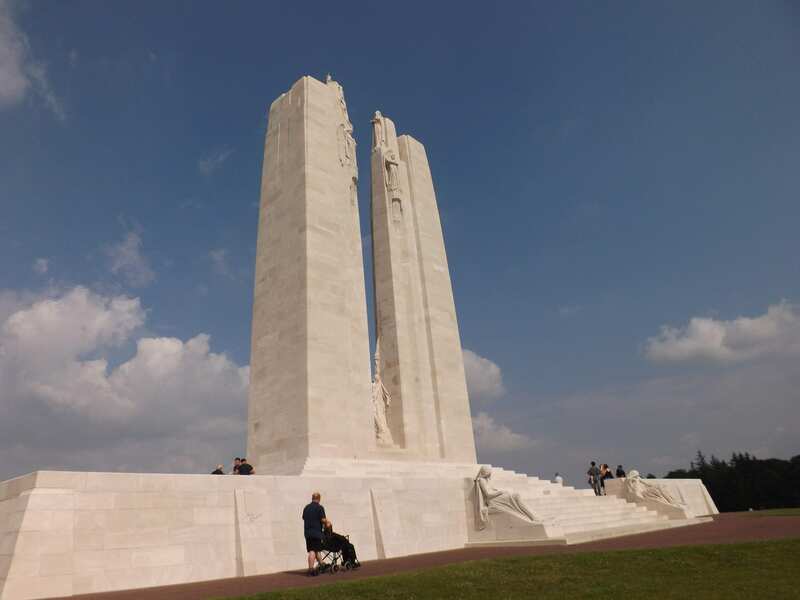 We travelled onwards in the coach to Vimy Ridge and the Canadian war memorial. As we approached, we looked through the windows at undulations in the fields. These were the visible remains of the trenches from both sides in the war. The extremes of human conflict and personal experience of those fighting there during the war had become symbolised simply now by just grass covered gentle folds in the ground. 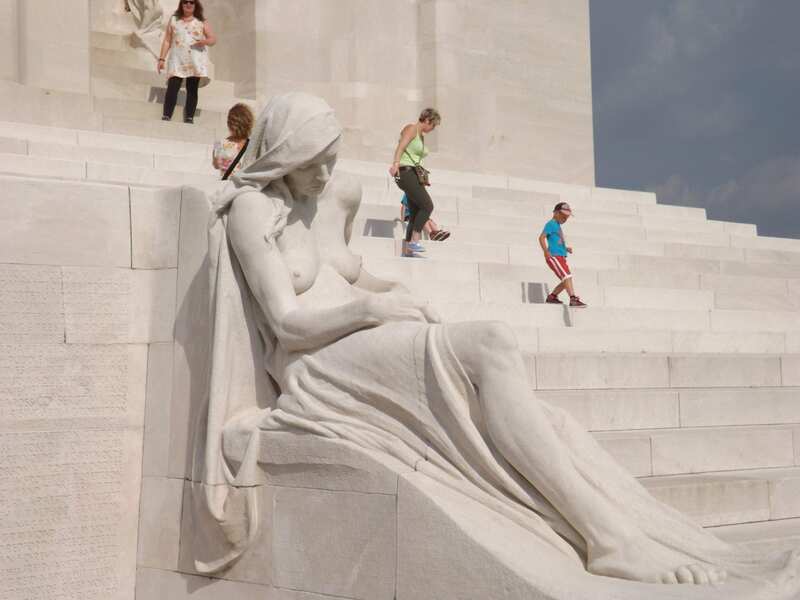 The memorial to the allied Canadian troops, 11,285 of them who died on French soil, is vast, tall and eternally permanent. It is an imposing reminder of what happened a century ago and a reminder of our current, cosseted lives. We all spent our last night in a very comfortable, modern hotel and dined in exquisite style. We were returning to London the next day. As we headed northwest, the coach stopped at Fromelles, a little village not far from Lille. There is a new museum here that was only opened in July, 2014. Fromelles was the site of a battle created deliberately by the allied forces that was supposed to divert enemy action away from fresh conflict in the Somme basin. About 5000 Australian soldiers, 1500 British and 2000 German troops were killed on the edge of the village. The British and Australians were buried in Pheasant Wood, nearby, by the Germans to prevent the spread of disease. It was a hot summer in 1916 and the bodies were treated with great dignity. The mass grave was only discovered in 2008 and many of the soldiers have now been identified. They have been given an individual burial in a cemetery on the edge of the village. The museum displays many articles of uniform, weaponry and personal possessions discovered at the time. 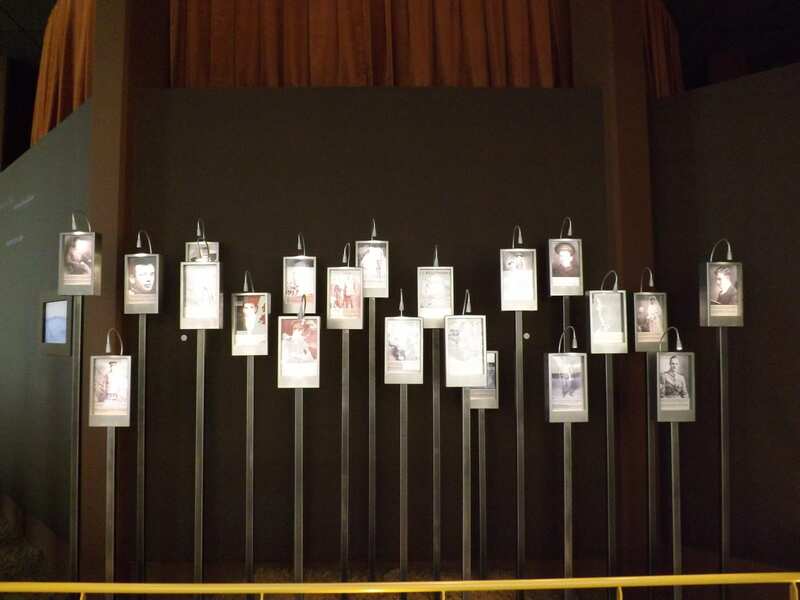 Photographs of some of the dead are displayed with great reverence. 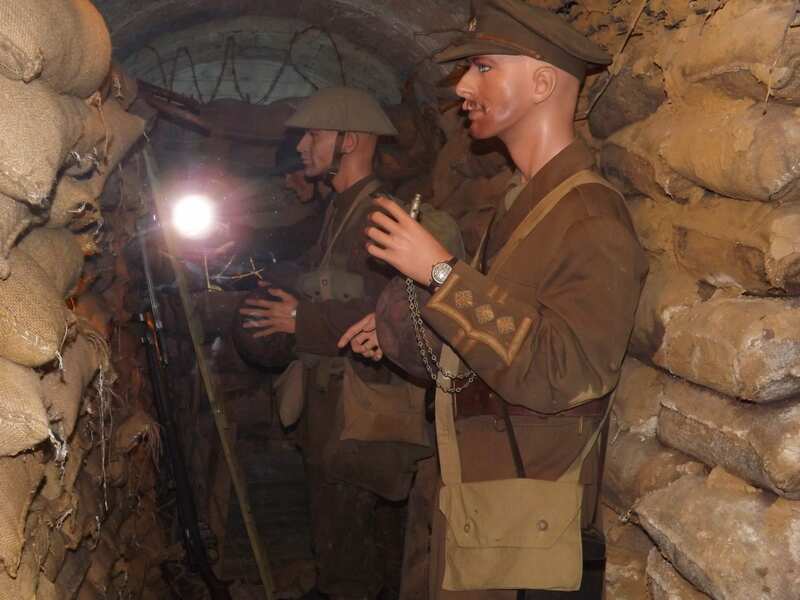 The Fromelles battle museum now attracts many tourists from Australia, New Zealand and elsewhere across the world. All of the artefacts are exquisitely exhibited. If you wish to remember the Great War in France, consider taking a coach tour. There are many companies in Britain and across Europe providing the service especially this year. No need to worry about parking your car or locating obscure sites. No need to find your own accommodation or filling your own petrol tank. A brief three or four day trip should cost from under 300 pounds to just over 500, depending on the itinerary. The coach will become your temporary home and you will make many friends from others that share your passion for family connections that were so vibrant not all that long ago. « Give us this day our daily blog ~ Eastbourne will re-ap-pier!